After traveling all over the world, Mark Nolting decided to return to Africa and travel from Cairo to Cape Town. He has been researching travel on the African continent for over 25 years and has even climbed to Uhuru Peak on Mt. Kilimanjaro. To get the most out of any trip overseas, a travel book is essential. It is even more important when traveling in Africa, since a safari can be rather expensive. Especially if you want to stay in private lodges with swimming pools. Do you want a private safari or would you rather travel with a group? Are you looking for gourmet European cuisine, local dishes or just wholesome fare? Are you looking for a romantic trip while staying in luxury tented camps or do you want to stay at a five-star lodge like Singita near Kruger National Park in South Africa. In this new edition there are over 50 maps, helpful charts and over 32 pages of color photographs. Where and when to see the best wildlife. Where to enjoy boat safaris, night drives, hot-air balloon safaris, horeseback safaris, walking safaris, photo safaris and even canoe safaris. What to wear – very important to get a pair of earth-colored boots and a high-quality pair of binoculars. Each chapter has a map of the area and a "facts at a glance" section. You will find information on the size of the country, population, capitals and official languages. Detailed information of each country is followed by information on the accommodations which range from deluxe to tourist class. There are pictures so you know what to expect. If you are looking for fields of flowers, you might want to head to Namaqualand from August to September. 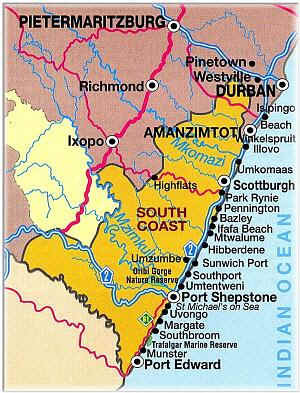 If you are looking for a dreamy tour along one of the most beautiful drives in Africa, you might choose the "Garden Route." You can stay in huge resorts or find isolation in a game reserve. Once you decide what you want and where you want to stay, you can look up further information and plan a safari with The African Adventure Company. The author dispels myths about travel in Africa and says one of the safest places in the world has to be in the African bush. You can also go to Africa for the mountain climbing, fishing, star gazing, scuba diving, snorkeling, whale watching and even white-water rafting. You will find information on Tanzania, Kenya, Uganda, Rwanda, Democratic Republic of the Congo, Burundi, South Africa, Botswana, Zimbabwe, Zambia, Namibia, Malawi, Swaziland, Lesotho, Seychelles and Mauritius. Additional features include information on the Latin/Scientific names of Mammals & Reptiles, Suggested Reading Lists, Places and People Index, Animal and Plant Index, List of Maps, List of Charts and a List of Animal Profiles. Mark Nolting is also the author of "African Safari Journal." He gives you all the secrets for enjoying your trip all the more. If you are looking for luxury, you might not want to make the mistake of booking a "full participation mobile tented camp safari." 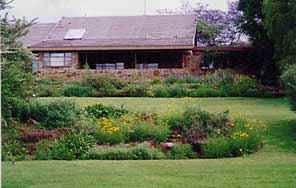 If you are honeymooning, your trip could turn into the ultimate Out of Africa experience complete with eating outdoors. I was impressed with the pictures of "Dining on a deck at Ngorongoro Crater Lodge." After living in South Africa for 12 years, I can tell you Africa is one of the most beautiful places in the world. Everyone seems to speak at least three or four languages and everyone seems to speak English and Afrikaans. The food is also incredible with added variety and exotic flavors like guava and granadilla. Being a "cat lover" at heart, we used to visit the game parks just to see the lions. This book brought back many memories and even the "memory" scent of the ocean. The areas around the South Coast (Coastal Forest) and Cape Town (Heathland) were our favorite holiday escapes from the area around Johannesburg, which is a Grassland (veld). A part of my heart will always be watching sunsets from the deck of a house at Cyara in Hekpoort, South Africa near the Magaliesberg Mountains where the Jacaranda trees burst with lilac blossoms. If you are dreaming of an adventure in Africa, this book will be essential. Mark Nolting has written a beautiful book based on his own exploration of Africa. He has also helped travelers plan the safari of a lifetime. After reading "Africa's Top Wildlife Countries," I'm convinced traveling with "The Africa Adventure Company" is the way to go! I was worried about traveling in Africa again, but after reading this book, I was very encouraged and have started dreaming of returning to my childhood home. 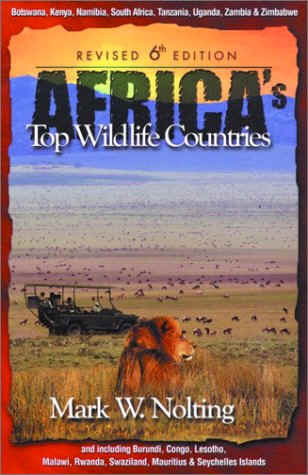 Also look for the "African Safari Journal" to take with you on safari. It contains valuable information including a phrase book, safari diary, map directory, wildlife checklist and trip organizer. You can record the key events of your safari. delicious cheese muffins in Africa.